Paddle with like minded people. 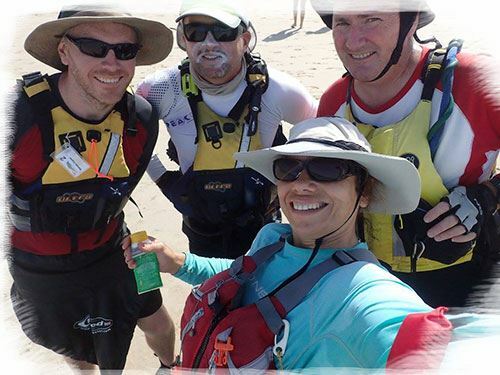 Meet other kayakers and make new friends while paddling the coastline of NSW and beyond. Paddling with others adds a fun and interesting dimension to your favourite activity. Become a part of and contribute to the social fabric that is the Club! Three to four editions of the Club Magazine. Sure you'll be able to eventually read some of the content online, but that is hardly a substitute for having a hard copy in the bookshelf at home for ready reference. Great paddles. Our Club trips are run by members who are qualified Trip Leaders. These trips include short day trips, long day trips and overnight trips in a variety of locations. You'll find trips in the calendar in areas in all parts of the NSW coastline and you will enjoy the scenery, the challenge, and the company. Regular trips. Several of our club members run a paddle on a weekly basis. Regular Skills Training. In addition to our regular trips and great paddles there are a number of formal training events are organised each year. You'll learn kayak rolling, tips, tricks and techniques from experienced Club members who are also qualified instructors. You will become a safer paddler and get more enjoyment from being on the water. Rock 'N' Roll Weekend. An annual weekend of trips, entertainment, training and socialising. It is a great festive occasion that 100 to 200 members attend. Free Classified Advertisements on our Website. We will run these ads on our website free for up to four months or until you request the ad be removed. Club paddles are covered by our club insurance policies. We purchase coverage for public liability, professional indemnity and personal accident insurance for members.